How was your weekend? I hope you all had a wonderful time with family, eating good food, and enjoying way too many treats! We had a great weekend. We did the traditional carving of pumpkins, watching Charlie Brown’s Great Pumpkin Patch, trick or treating until the kids were begging to stop (my Dad is a die hard trick-er-treater!). 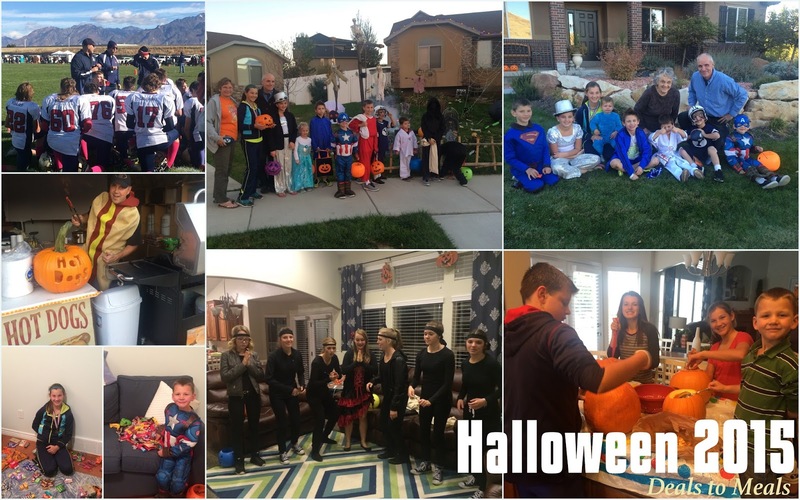 We also had a great time at my son’s Halloween football game and having tons of teenagers over at our house. Overall it was a really fun weekend and I hope you had a good one too! I am a huge Cajun fan. I love anything with a hint of Cajun seasoning, so when I added Cajun seasoning to my favorite homemade alfredo sauce, the combination was a huge hit! 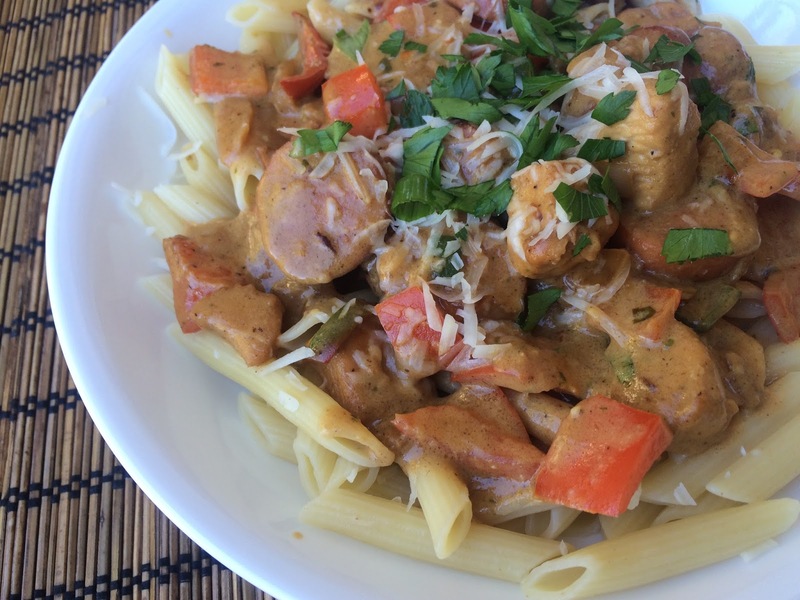 Chicken is on sale again this week, as well as pasta and bell peppers, so it’s a great time to make this dish and feed your family for under $10. Serve this pasta with our Garlic Toast and a fresh salad and you have a weeknight meal that can come together in 30 minutes or less. Hope this Cajun Pasta gets your week off to a good start! Trim the chicken from any excess fat. Cut the chicken into one inch pieces. On the same cutting board, cut the sausage links into thin slices. Dice the onions as well. In a separate soup pan, bring water to a boil and cook the pasta until al dente. When pasta is done, drain and set aside until ready to add to pasta sauce. Heat a saute pan to medium-high heat. Pour into the pan the olive oil and let it heat up for a minute. Add the diced onions to the oil and saute for a couple of minutes. Add the diced chicken and continue to saute on high heat, so the chicken can get nice and brown. While the chicken is cooking, cut up the bell peppers and jalapeno pepper. To the chicken, sprinkle the Cajun Seasoning onto the chicken and season with extra salt and pepper. To the chicken, add the sliced sausage pieces and the bell peppers. Continue to saute until the sausage is warmed through. Once all of the ingredients are cooked, add the alfredo sauce to the mixture. If you are using store bought alfredo sauce, just pour that into the pan. If you are making your own alfredo sauce, make that in a separate sauce pan and then pour over the chicken/sausage mixture. Pour sauce over the cooked noodles. Garnish with fresh parsley and serve. In a saute pan, bring the butter to medium heat and cook until it's melted. Add the garlic and the whipping cream to the pan and whisk on medium heat until the mixture begins to thicken. Add the parmesan cheese and salt and pepper to taste. Add the alfredo sauce to the Cajun Pasta when chicken and sausage are cooked. PreviousGame Day Beef Stew and BEST ever Cornbread!